2PM is a South Korean boy band, originally a seven-member group, but currently consisting of six members due to the sudden contract termination of leader Jaebeom following an Internet controversy in September 2009. They are managed by JYP Entertainment. 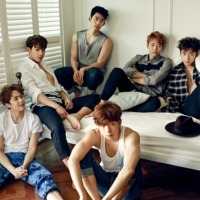 The current members are Junsu, Junho, Nichkhun, Taecyeon, Wooyoung and Chansung. 2PM is one of the two subgroups branched out from the eleven-member (before Jaebeom's departure) boy band One Day, the other being 2AM. They debuted with the song "10 Jeom Manjeome 10 Jeom" (10점 만점에 10점, lit. 10 Points Out of 10 Points), which showcased their acrobatic dance styles. They achieved their first No. 1 song with "Again & Again".